1 x 28" Tall Studio Quality High Output Accent Light Stand: Material is Premium Aluminum Alloy Construction; Solid Safety 3 Legs Stages; Suitable for Accent Light; Table Top Light. 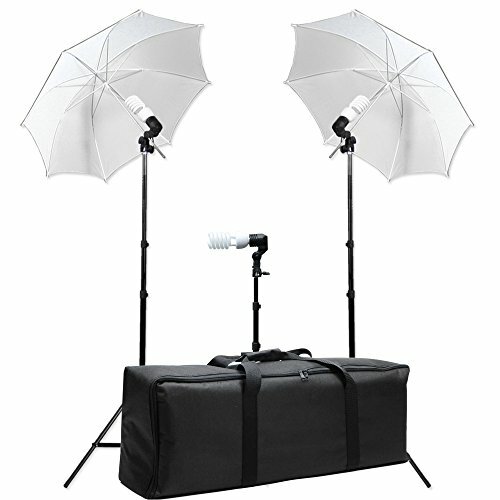 2 x 86" Tall Studio Quality High Output Light Stand: Solid Safety 3 Legs Stages; Height adjustable Min 30" - Max 86.5"; Solid Locking System for Light Safety. 3 x Studio Single Head Photo Lighting Fluorescent Light Holder: Max power can be used 105W energy saving bulb; Lamp base E26/E27 x1; Code & Plug included (9 ft.)for 8mm sharft. 2 x White Premium Umbrella Reflector: Made of High Quality Nylon Construction; Works well to diffuse the light from any Flash/Strobe Light and Constant Light (See Application Image shown above); White: produce neutral color temperature; Lightweight and Easy to set up; Premium Umbrella Snow White translucent Reflector (33" Wide); Adjustable Light Head for perfect light stream to your object. 3 x Day-Light Studio Light Bulb: Energy Saving Compact Fluorescent Spiral Bulb; Saves energy up to 80%; Color Temperature: 6500K; 45 watt x 1 compact fluorescent 200 watt equivalent; Overall Diameter: 3 "; Overall Length: 8"; 1 x Carry Bag: All-in-One Bag and Move your Studio; Durability: Made of High Quality Material; Heavy Duty: Support up to 80 Lbs; Water Resistant.